Medical abortion is where a pregnancy is ended with the two drugs mifepristone and misoprostol. The drugs come in the form of pills and are taken one to three days apart. This first medicine mifepristone block the hormones needed to enable the pregnancy to continue to grow and the second medicine misoprostol causes the cervix to soften and open and the uterus or womb to start contracting. The products of conception will be expelled during this phase and the symptoms and sensations are the same as with a spontaneous abortion (miscarriage). Currently this treatment is not available within the Irish Maternity System due to the presence of the 8th amendment in the Irish Constitution. So these drugs, whilst they can be prescribed for other conditions in Ireland cannot be prescribed by a health care professional for the termination of pregnancy unless the woman’s life is in danger. 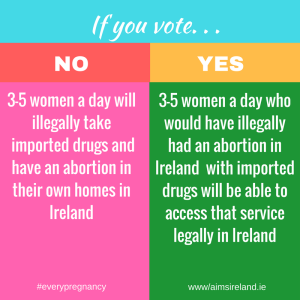 None the less it is estimated that between 3 and 5 women a day in Ireland take these medicines to induce an abortion in their own homes. These medicines are not available over the counter without a prescription and so are imported illegally for the purpose of self administering an abortion. The Irish College of Obstetricians and Gynaecologists have highlighted that the lack of regulation supervision and after care associated with self administration is unsafe and undesirable. If the 8th amendment to the Irish Constitution were to be removed then the 3-5 women who are self administering the medicines in Ireland would be able to take them within the maternity care service. Women would receive appropriate scans and care in between administering the two medicines and would receive after care checks treatment and counselling as required,, including information on contraception.